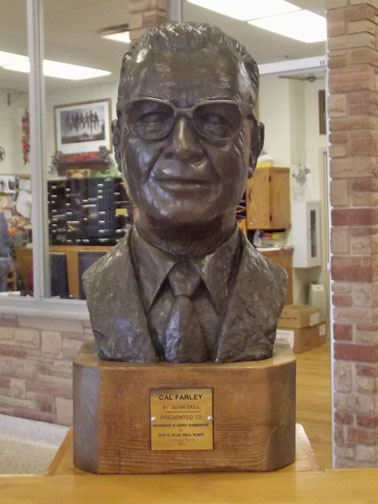 Bust of Cal Farley in the visitor's center. Leaving the visitor’s center we hiked back out to the highway entrance where several markers are located. Blue Star Memorial Highway Markers are located throughout the US. to honor the servicemen and women of the U.S. Armed Forces. Historical marker for the town. Historical marker for the LS Ranch. Director of Cal Farley’s Boys Ranch 1944-1955. Erected in 1962. Another plaque on the pylon. Texas highway department marker for Oldham County from 1936. From there we retraced our steps back toward the ranch but turned into the cemetery entrance to visit Boothill. Another Quanah Parker Trail Arrow. Looking up at Boot Hill Cemetery. Historical marker for the cemetery. Ed in front of the cemetery entrance. The nearby cemetery is a pet cemetery. We had to walk over and see what it was. Leaving Boot Hill I misread the instructions and we continued back toward the visitor’s center. Only when I reached it did I realize my mistake. Rather than walking back out again the way we just came we decided to use the map and walk the route backwards! Arched entrance to the Boys Ranch. (There are girls there also by the way). Titled: “IT’S WHERE YOU’RE GOING THAT COUNTS." Once proud courthouse is now a museum. 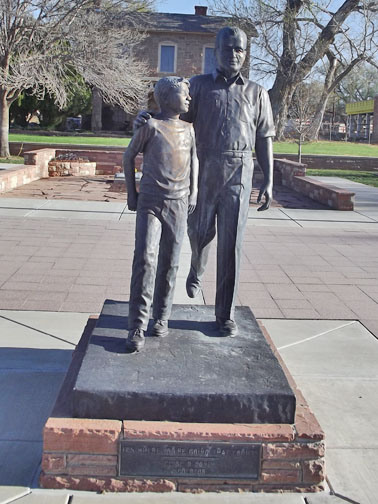 Marker in front of the courthouse/museum. Cal Farley used to be a Wrestler! Ed with a Wooden Indian found hiding under the stairs. Old printing press on display. Tascosa schoolhouse still used for gathering. Walk route circles the ponds on a dirt road. Bridge over one of the ponds. Beyond the pond is a climbing tower it looks like. Ed saw a huge catfish in this pond. Murals on the Activity Center. Mural on this rodeo arena building. From the rodeo arena we walked back out to the cemetery, past the big arrow again and into the visitor’s center. Very nice walk.